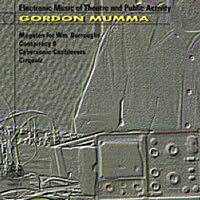 Not to be confused with a British mother or a corpse wrapped up in gauze, each otherwise known as Mummy, Gordon Mumma is a composer–mostly of electronic music–who got his start in back in the 1960s in Ann Arbor, Michigan. He co-founded the Cooperative Studio for Electronic Music and the legendary ONCE Festival, then went on to play in the ranks of the Sonic Arts Union and the Merce Cunningham Dance Company. Over the decades, Gordon has also worked as a music professor at many universities. You are currently browsing the archives for the Gordon Mumma category.